If you are someone who’s decided it’s time to capture some stories from a parent or other family member but have realized you just aren’t going to have the time, by all means call us to schedule an Audio Keepsake. BUT, if you’re ready to do the work yourself, we have a new recommendation for a recording device. It’s easy to use and produces high-quality audio. In fact, Holly, my technology director (and husband), is quite excited about it. To find out more, keep reading! In the last month we’ve had a few readers ask about the best way to start a recording project. One was a 50-year-old mother wanting to capture some of her father’s stories, another was an elementary school teacher planning a family oral history project for next fall. Back in January 2008 (Tip 1: Start Small) , we’d recommended the Olympus VN-4100PC digital recorder for approximately $48. Now, since the product has been discontinued, it’s actually selling for more. And to boost the sound quality, we’d suggested adding an external microphone, though now we’d recommend adding not one but two lapel (or lavaliere “lav”) microphones (one for you as the interviewer and one for your subject), as well as a splitter so you can connect both into the recorder. We’ve used this method before and the sound is OK – but not great – because its primary purpose is to keep track of notes for later transcription. At the time, there wasn’t a reasonably priced improvement, even when you added in the cost of two lapel mikes ($20 each) and a splitter (about $5), totaling over $90. 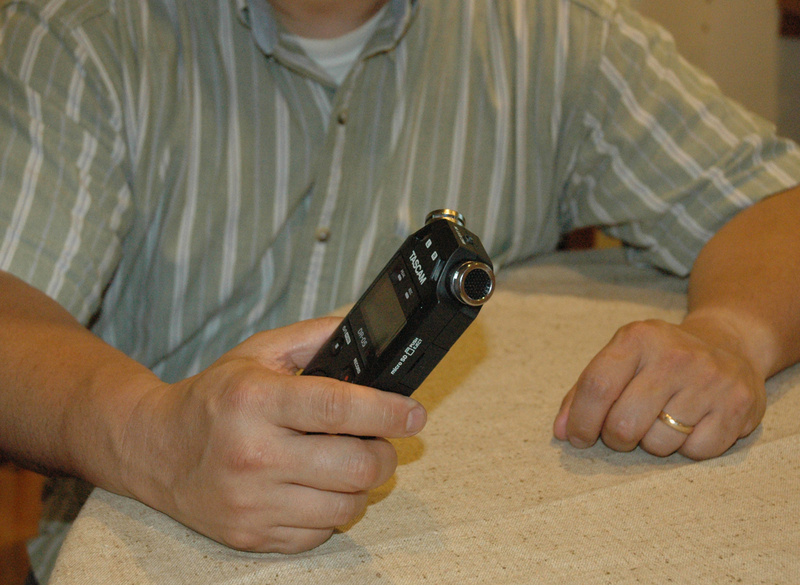 The Tascam DR-05 digital recorder gives excellent audio quality without needing to add mics. The company’s tag line for the product is “Premium sound quality that’s easy to use,” and we have to agree. To get tech details and product specs, click HERE . To listen to a user review and mini-tutorial, which was recorded using the DR-05, click HERE. I’ll let Holly tell you about the sound details (see below), but why I like it so much is that it allows impromptu and low-key recording sessions without sacrificing audio quality. I don’t have to attach lapel mikes (and remember to turn them on), or make sure I’ve got everything in the right plug… I can just pull the recorder out of my bag, turn it on and hold it between us. Here’s an example of a recent session where I did just that, capturing the story of a woman’s husband’s grandfather as a new immigrant to our town. Click HERE to listen. 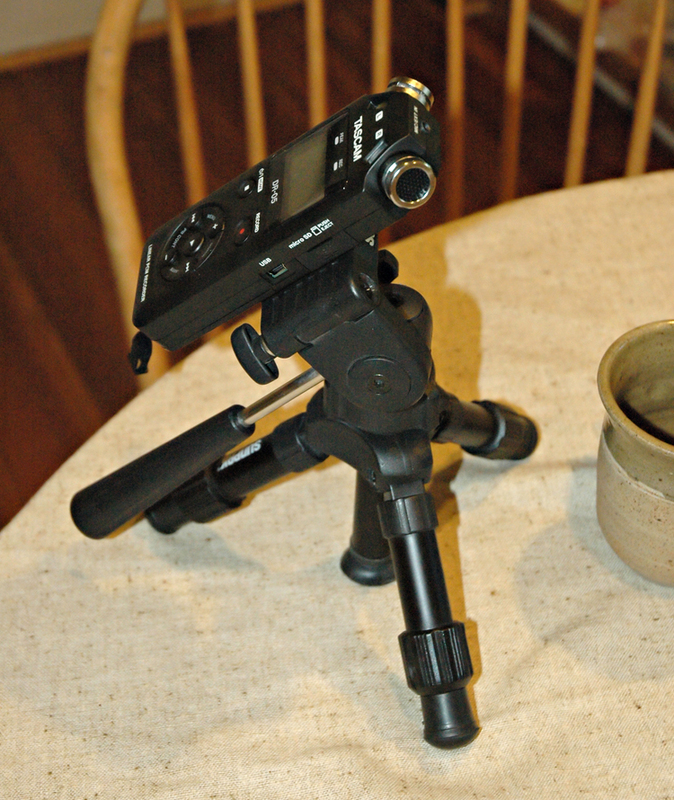 If my recording session was not impromptu, then I’d attach the recorder to a small tabletop tripod (about $20) so I wouldn’t have to worry about keeping my hand still to avoid handling noise. The USB cable that comes with the recorder plugs into a USB port in your computer, then you copy the audio file to your desktop or laptop, and you can edit it with the free audio editor Audacity or some similar product. Though we use a professional-level field recorder and cables when we record our Audio Keepsakes, and full-size mics and mic stands, at this price and for this convenience, you can hardly go wrong. (And no, we’re not getting a kickback from the company.) OK, here’s Holly on sound quality. The DR-05 is designed to record the full fidelity of music and voice (in either MP3 or WAV format), and has features to match – for instance, the ability to record CD-quality sound and, while recording, it allows you to monitor and adjust input levels (there’s a headphone jack). While the Olympus unit we recommended previously offered 22KHz, 8-bit sound, the Tascam DR-05 offers 44KHz, 16-bit sound (and higher), and yes, there IS a difference! After last month’s newsletter, we received a few queries about how to convert audio tapes to a digital format on the computer. One person had reel-to-reel tapes he’d recorded at a concert many years ago. Another had tapes of doing a radio show during college. 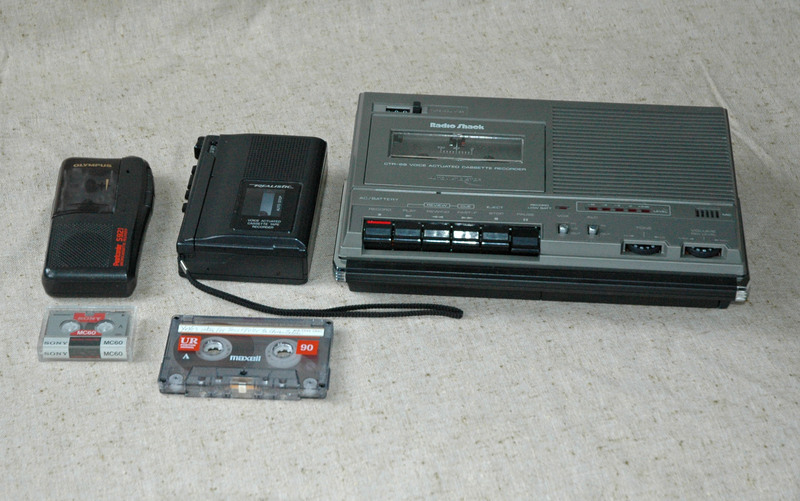 Whether your tapes are old reel to reels, cassettes or microcassettes, the process is pretty much the same, and if you still have the player, it will probably only cost you the price of a cable. So if you or family members have any old recordings with content you’d like to save – and perhaps edit –read on! First you need to locate a player for your tape. If you don’t still have a working reel-to-reel player or cassette or microcassette recorder, ask your friends and family. If that turns up nothing, try a local school. Cassette players are pretty easy to come by, perhaps even at your local Salvation Army or Goodwill store. Reel-to-reel and microcassette players will take a bit more digging. But you can find all online, whether a used machine for reel to reel (from eBay) or a new one for cassettes and microcassettes (from Office Depot, Radio Shack, etc…). Next you will need a double “male” cable to connect your tape player to your computer. One end of the cable goes into the headphone jack on your tape player. The other end goes into the microphone jack on the back or side of your computer. This cable is sometimes called a “male-male mini phone plug,” or a “male to male stereo cable.” The good news is that it’s cheap – between $2 and $4 – and easy to find from a local electronics or big box store. If you order online from Amazon, for instance, you could get a 6-foot-long “3.5mm male to male stereo cable” for $2.11. You can buy a longer one if you need it. The third element you need is the software to do the digital recording. Since it’s free and relatively easy to use, we recommend Audacity (available for both PCs and Macs). Just google Audacity and download it or click HERE. If you have not used Audacity before, you will probably want to watch a tutorial or two. Try this one, or check out one of the many available on YouTube. The default audio settings on your desktop or laptop might be fine as they are, but if things don’t work as expected, you’ll need to go through a tutorial more closely and make adjustments. Another helpful item is a pair of headphones, especially if you have an old player with built-in speakers that makes a lot of noise as it’s playing. 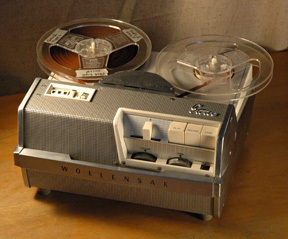 Our old Wollensak reel-to-reel machine sounded like a tractor as the tape played through and made me wonder if it was worth transferring the tapes to begin with. But when I listened through the headphones, the audio tapes themselves were fine. It also helps to listen to the tapes first and take notes with counter readings of when sections you want begin and end — unless you plan to record a tape from start to finish. OK, ready to get started? Plug one end of your male/male cable into the headphone jack (output) of your tape player; plug the other end into the microphone jack (input) of your computer. Get your tape cued up roughly where you want it to start. Click the RECORD button on Audacity, then hit the PLAY button on your tape player. If it’s working, you’ll see a wave form show up on your computer screen. If it’s not, recheck connections, make sure volume is turned up enough, and refer to your player manual and/or tutorials. You should see a meter on your screen that shows recording levels — watch this meter to make sure the level doesn’t exceed zero and go into positive numbers. 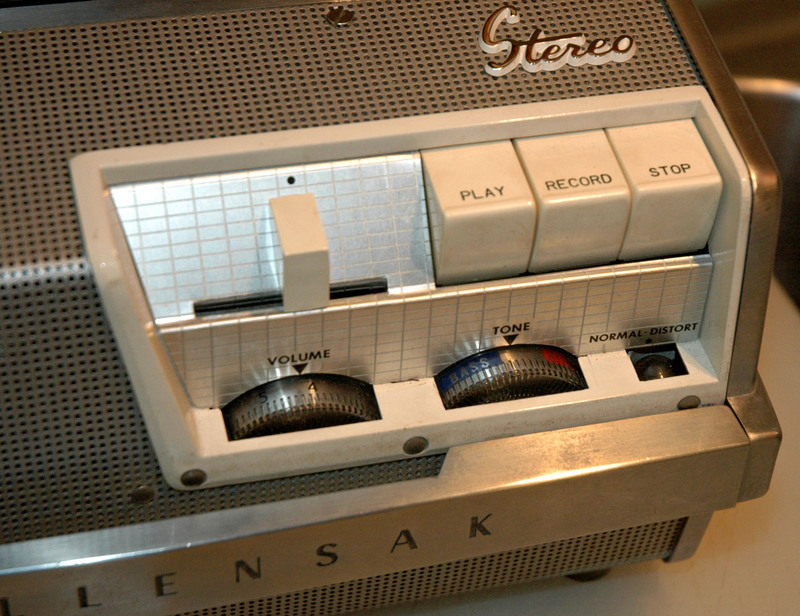 To reduce the input volume (measured in decibels (dB)), either turn down the RECORD volume in Audacity (a slider near the top of screen), or turn down the volume of the tape player. If the wave form is very low, turn up the RECORD volume in Audacity or turn up the player volume. Ideally, you want the wave form to nearly touch the top and bottom of the frame without “maxing out.” If the level goes beyond zero you will have some distortion. Make sure you do a test recording (say, 10 to 30 seconds) before recording your entire tape, then stop and rewind and play back what you’ve recorded on your computer. Make sure your speakers are turned on and working. If you have controls on your tape player beyond volume, such as TONE (bass, treble or balanced tone, for instance), try different settings to see which one sounds the best. We found significant improvement in the audio quality when we tried different settings. If you’re satisfied with the result, restart or finish your recording session, then save to a “.wav” file. In Audacity, for example, under the File menu, select “Export to wav.” As a wav file, you will be able to play it on your computer by double-clicking it, burn it onto a CD, or edit it. You can edit directly in Audacity (still free), or in a video editing program such as Sony’s Vegas Movie Studio (not free). Of course other editing programs are available, but besides being free, Audacity has a large user base, so you’ll stand a good chance of getting your question answered if you google for a solution. Editing not only lets you cut out what you don’t want, and adjust volumes within the recording, but you can also add a voiceover and/or music. Our favorite site for free music (royalty-free, but not copyright free, so you need to give appropriate credit for what you use) is Kevin MacLeod’sIncompetech site. And finally, if you’re comfortable with Audacity, you can try the various “effects” to remove or lessen background noise such as hiss and hum, or compression to even out volume levels. A word of caution, though. When it comes to these “tweaks,” a little goes a long way. Be careful you don’t remove all hum just to find that your Dad’s voice no longer sounds like him. When it comes to sound, there is a lot to learn! And that’s it. Now that we’ve transferred the reel-to-reel tapes from my childhood (see the January newsletter if you missed it), next on my list is the microcassette of my husband interviewing me on the way to the hospital while in labor with our first child. If you’re guessing I was in no mood to be interviewed, you guessed right! The audio quality is poor because we’re in the car and we didn’t use an external mic, but the content is irreplaceable (if not unrepeatable). If you’ve tried a tape transfer, let us know how it went and what you learned. Good luck!